As the school year is now in full swing, let’s turn our thoughts to brass tone production. No doubt, your students are all playing a lot right now and are probably working the muscles more than ever before. Likewise, we may also be teaching a new crop of young brass players and trying to instill strong concepts with them. It’s around this time that issues and poor habits may start to form and it is my hope that this blog post will help address some of these concerns. By creating a clearer path for tone production, we can successfully develop a stronger fundamental musician and improve efficiency in the process. One of the most important things to focus on in brass playing is air production. Sounds simple, right? Wind instruments obviously need WIND to produce sound. However, most of the common issues associated with poor tone, weak technique and lack of range and endurance can simply be attributed to our inability to use air correctly. I have found that in my professional career, returning often to this foundation of air-flow and breath support is key for continued success. Arnold Jacobs, the legendary brass pedagogue, advocated the concept of “Wind and Song,” meaning that by focusing on beauty of tone and air, all other aspects of performance will begin to follow. To play a wind instrument successfully, you must focus more initially on the wind aspect and less on the muscular aspect. As building muscular strength is highly important for brass players, even more so is the approach to air and playing with a beautiful, resonant and relaxed sound. Let’s talk about some pedagogical tools, listed below, that we can use to improve our beauty of tone and our ability to perform efficiently as a brass player. To promote this “beauty of air concept,” breathing exercises have become more and more common in band programs across the world. Having a simple routine that focuses on various aspects of the breathing process can aid in the development and improvement of tone at all levels. And, while we don’t have to do breathing exercises to play with a great sound, they can help us better understand how the body functions and how this relates to generating sound on a brass instrument. I like to use exercises from the Breathing Gym (Pat Sheridan and Sam Pilafian) that focus on what we call “flows and therapies.” Flow exercises focus on our ability to move air evenly and consistently, aiming for open oral shapes and tonal resonance and relaxation. Therapies are designed to make us work harder, essentially overtraining our bodies to do something that is very simple in the long run. I like to incorporate at least 1-2 of each of these daily with my students (and in my own playing). This can help us to further understand how the body and air work together to create a great brass tone. Understanding how our bodies vibrate and resonate when playing a brass instrument can also help us develop a fuller, more relaxed and rich sound. I like to start with some basic humming, thinking about a tall “AH” syllable. I combine this with matching pitch to a drone, which is also a great way to get the ears dialed in and teach you how to really HEAR what in-tune sounds like. Audiation is the concept of prehearing a note before you play, and should be stressed when beginning to hum and sing. We then work on getting this sound to resonate and ring the room, listening for overtones and sonority. The goal is allowing the vocal sound to come out without force while maintaining fullness, a key component of great brass playing. Once we have begun to achieve good pitch and good resonance with the singing, we then will carry this concept over to the mouthpiece. To Buzz or Not to Buzz, That Is The Question! There has been healthy debate over the years on the value of mouthpiece buzzing. I subscribe to the philosophy that when buzzing is both approached and taught correctly, the positives outweigh the perceived negatives. We can learn much about balance and resistance through mouthpiece work. The key is to produce a very relaxed, free and somewhat “reedy” sounding buzz. If the buzz is tight and too focused, it can have negative effects on tone production and cause a pinched and thin tone. If under-supported, it will not create the same resonance or help us play in tune and project. I believe in a simple truth as a brass player: if my students are playing with their best sound, it’s very likely they are also playing in the center of their instruments. Likewise, if they are playing in tune, they are likely playing with their best sound. 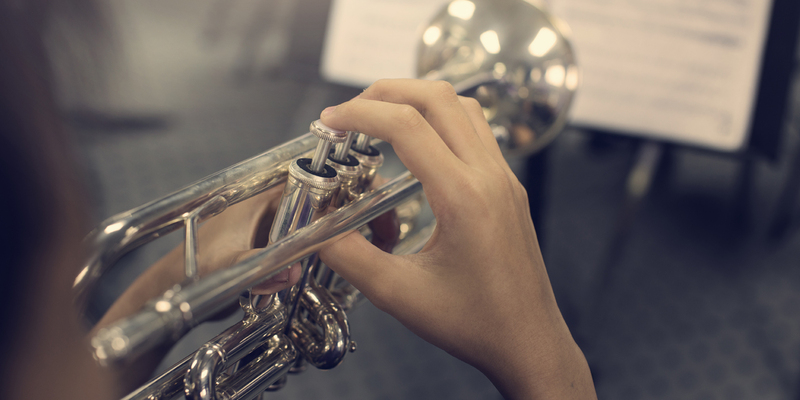 Focusing on exercises that help us to play more “in tone” are a great way to improve individual sounds and develop a higher level of ensemble skills across your brass section. To put this concept to use, have two of your students match tone. Ask one of them to play with the same sound and same sense of dynamic/intensity/energy as the other control model. After a few attempts, the students will invariably get closer to blending and, as often happens, playing more in tune together. Many educators, myself included at times, fall into the bad habit of just sticking a tuner into a student’s bell and expecting them to play in tune across the horn. Such an approach takes student ownership out of the mix and encourages them to rely on the teacher telling them if it’s right or wrong. In contrast, matching exercises put the focus back on the students, allowing them to grow faster and really hear what in tune and in tone sounds like. I’m always amazed at how quickly students will grow when we allow them the opportunity to improve themselves. Over time, those tuning slides that were all over the place begin to align much more closely as a true sense of playing in tune is developed in each player. While all of the above concepts are important tools in sound production, modeling is perhaps the most basic and crucial element to achieving a great sound. Simply put: PLAYING with a great sound requires HEARING a great sound. While we can certainly debate the merits of style and the appropriate sound for each musical setting, there is no denying that all great sounds have similar elements in common. Things like resonance, sonority, playing in the center, fullness, core and ringing overtones are all elements of a great individual sound. So how do we achieve this? Creating sound models for students at all levels is important, and what may begin as simply matching older players in your band should develop into listening to professional musicians and recordings of the highest quality. As educators, it’s our responsibility to help provide students with these models. In essence, if your young brass players are listening to the likes of the Chicago Symphony Brass Section, Count Basie Orchestra and Tower of Power Horns, then they are much more likely to develop a stronger aural image of a great sound than those without these models. SmartMusic includes recordings of professional ensembles to both model great performances and to inspire student practice. Try it for free. Through repetition, students become part of an acclimation process. In time they’ll sound more and more like their models, as their brains and bodies figure out how to do some of this acclimation on its own. Modeling examples and recordings should be used from day one and can be very powerful tools in helping to develop a correct and appropriate tone. Dr. Chip Crotts serves as director of jazz studies and assistant director of bands at the Georgia Institute of Technology. 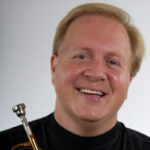 A GRAMMY-nominated artist and a Yamaha performing artist and clinician, Crotts has worked with artists such as Ray Charles, The Manhattan Transfer, Natalie Cole, Frankie Valli, the Temptations and Maynard Ferguson. Presently the brass caption manager for the Santa Clara Vanguard, Chip also remains an active adjudicator for several organizations including Bands of America, Drum Corps International, and Winter Guard International. Dr. Crotts received degrees from East Carolina University, Penn State University, and a D.M.A. in trumpet performance with a jazz emphasis from the University of Texas at Austin.